Unlike traditional dry-wells, Field Metrology Wells maximize speed and portability without compromising the six key metrology performance criteria laid out by the EA: accuracy, stability, axial (vertical) uniformity, radial (well-to-well) uniformity, loading, and hysteresis. All criteria are important in ensuring accurate measurements in all calibration applications. Field Metrology Well displays are calibrated with highquality traceable and accredited PRTs. Each device (process and non-process versions) comes with an IEC-17025 NVLAP-accredited calibration certificate, which is backed by a robust uncertainty analysis that considers temperature gradients, loading effects, and hysteresis. The 9142 and 9143 have a display accuracy of ± 0.2 °C over their full range, and the 9144 display accuracy ranges from ± 0.35 °C at 420 °C to ± 0.5 °C at ± 660 °C. Each calibration is backed with a 4:1 test uncertainty ratio. The process versions of Field Metrology Wells have onboard non-volatile memory for documentation of up to 20 tests. Each test can be given a unique alphanumeric ID and will record block temperature, reference temperature, UUT values, error, date, and time. Each test can be easily viewed via the front panel or exported using Model 9930 Interface-it software, which is included with each shipment. Interface-it allows you to pull the raw data into a calibration report or an ASCII file. You’ll find Field Metrology Wells intuitive and easy to use. Each unit is equipped with a large, easy-to-read LCD display, function keys, and menu navigation buttons. Its “SET PT.” button makes it straightforward and simple to set the block temperature. Each product has a stability indicator that visually and audibly tells you the Field Metrology Wells is stable to the selectable criteria. Each unit offers preprogrammed calibration routines stored in memory for easy recall, and all inputs are easily accessible via the front panel of the instrument. Never buy a temperature calibration tool from a company that only dabbles in metrology (or doesn’t even know the word). 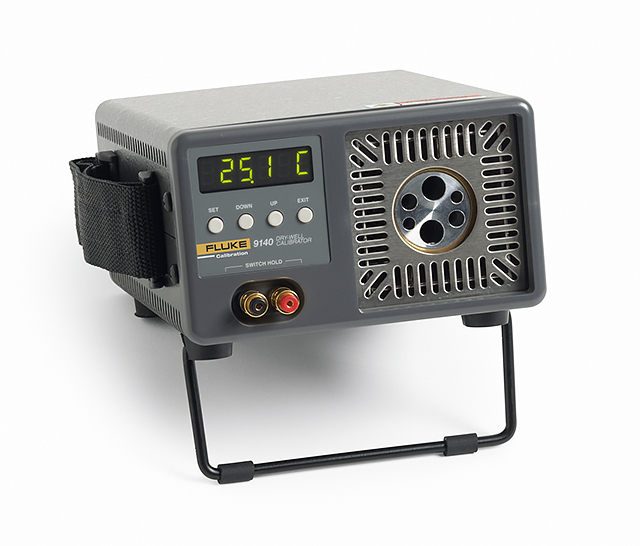 Metrology Wells from Fluke are designed and manufactured by the same people who equip the calibration laboratories of the world’s leading temperature scientists. These are the people around the world who decide what a Kelvin is! We know a thing or two more about temperature calibration than the vast majority of the world’s dry-well suppliers. Yes, they can connect a piece of metal to a heater and a control sensor. But we invite you to compare all our specs against the few that they publish. (And by the way, we meet our specs! ).